DURAN DURAN, MICHAEL SCHENKER GROUP, DEF LEPPARD, ECHO & THE BUNNYMEN, ALCATRAZZ, IRON MAIDEN, SCORPIONS, QUIET RIOT, JUDAS PRIEST, RAINBOW, VAN HALEN, SHEENA EASTON, CULTURE CLUB, NEW ORDER, ROMAN HOLLIDAY, MICHAEL JACKSON and much more!! more DURAN DURAN, WHITESNAKE, WHAM!, U2, NIGHT RANGER, ASIA, OLIVIA NEWTON-JOHN, BILLY IDOL, MOTLEY CRUE, BOY GEORGE and moe!! Size: about 7"x 10" x 1/2"
A MUST for any fan/collector of GARY MOORE!! 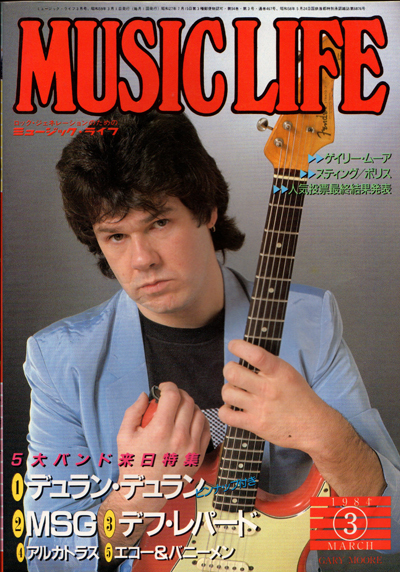 Click the button below to add the GARY MOORE Music Life (3/84) JAPAN Magazine to your wish list.